In the midst of preparing for an upcoming installation—as I am now—I often need to remind myself (again) why I’m so enamored of hot glue as a sculptural media. Might it be that when the work gets tough, the tough get crazy … or crazier? It’s incredibly time-consuming—and physically exhausting. Standing on feet most of day. Pulling the trigger of glue gun thousands of times. To avoid tangling, every glue strand has to be wrapped and packed individually after comes out of the water and is towel dried. So … why oh why?! Because it’s magical! There’s no other word for it. The way the goo oozing from my glue gun transforms into glass-like squiggles so compellingly evocative of the rippling water and drizzled ice of my childhood, growing up in Minnesota. Since creating my first solo—Ad Infinitum—for the Boise Art Museum in 2008, my artwork has prompted a myriad of associations. 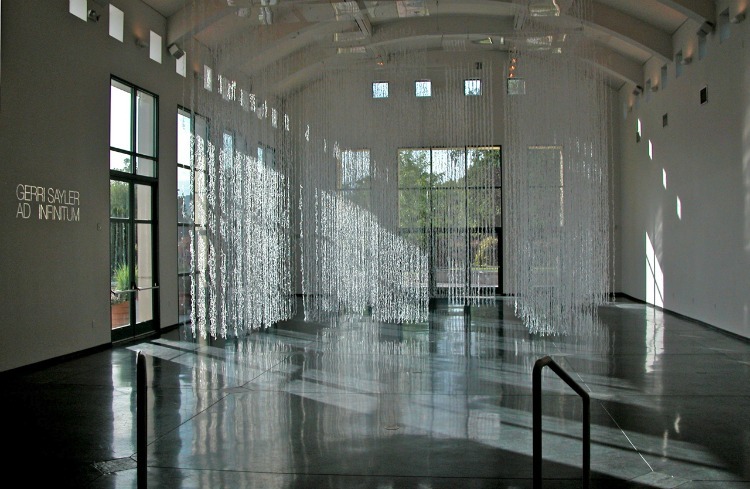 I’ve created a half dozen site-specific installations, including Nascent for Suyama Space in Seattle (2010). Most recently, Evanescent for Missoula Art Museum (2012) and Interstitial for University of Wyoming Art Museum (2012). My latest installation—Numinous—will open October 2 at Central Washington University’s Spurgeon Art Gallery.